Histological techniques 4. Sectioning. Ultramicrotome. Atlas of plant and animal histology. Very thin sections, known as ultrathin sections, are needed for studying the ultrastructural features of cells and tissues. These sections are usually about 40 to 80 nm in thickness and are observed with the transmission electron microscope. Ultrathin sections can be obtained from samples embedded in a very hard compound, like epoxy-type resins. 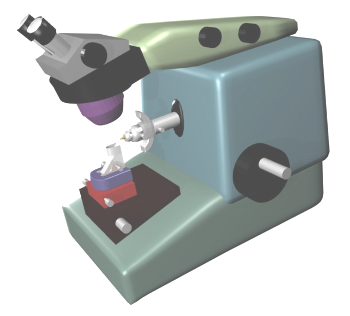 After polymerization, resin blocks are sectioned with a special microtome, the ultramicrotome (Figure 1). It is a very sophisticated microtome that can push the sample toward the blade in very short distance intervals (nanometers). There is another apparatus, known as ultracrytome, that can get ultrathin sections from frozen tissue. It is used when some molecular features we are interested in are altered during the embedding process. Ultramicrotome is designed for cutting by a mechanism similar to the paraffin microtome, but it is much more sophisticated and precise. 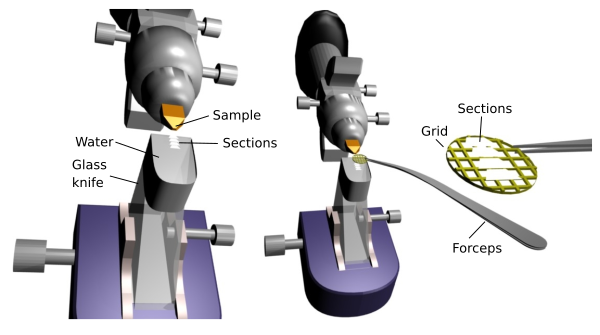 So precise that it is possible to change the section thickness with differences of several nanometers. Currently, it is a mechanical device, but in older ultramicrotomes the advance of the sample over the blade was by heating the specimen arm. By regulating the heat intensity, the specimen arm grows in length by dilatation and therefore section thickness change. The sample holder has a complete built-in system for orientating the surface of the sample to be sectioned with respect to the blade. Since sections are extremely thin, any vibration or temperature change may change the thickness between successive sections. Thus, the ultramicrotome should be placed in a room free as possible of vibrations and with a regulated and constant temperature. Ultramicrote are usually held in a special table with mechanism to absorb vibrations. There is also an external device for controlling the sectioning process (start and stop, thickness, cutting speed; cutting window, lights and other parameters) without touching the ultramicromote with the hands, so that vibrations are further prevented. Before the first section is obtained, as happened to paraffin embedding, a truncated pyramid has to be done in the resin block. This trimming process can be carefully performed with a sharp blade. However, there is a dedicated apparatus for this purpose that contains a milling system and a stereoscope. The trimming of the resin block must be very precise because the cutting surface needs to be very small, usually from 0,5 to 2 mm2. The pyramid body with the trapezoidal surface are similar to those described for paraffin embedding, a cutting edge a smaller parallel edge for getting long and straight rows of sections. Before obtaining ultrathin sections, it is common to get a thin section (0.5 to 1 µm in thickness) that can be visualized at light microscopy, so that a complete image of the tissue can be observed. This is a good practice to give context to the electron microscopy pictures or for proper orientation in the ultrathin section when observing with the electron microscope. Ultramicrotome knives have very sharp cutting edges, needed to get ultrathin sections. 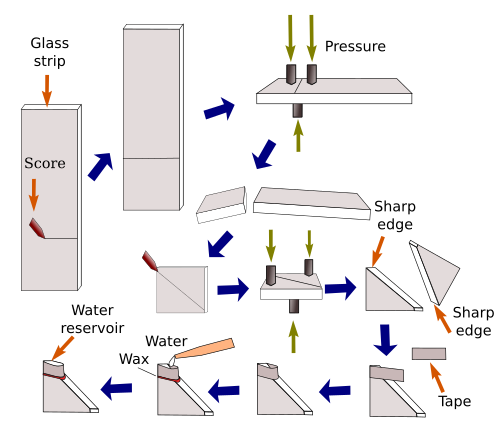 They are usually made of special glass and are crafted from glass strips (Figure 2), by making streaks and pressures at precise points that break the glass strip in squares and then in knives. However, the higher quality of ultrathin sections is obtained with diamond knives, but they are much more expensive. Although the current ultramicrotomes are well designed to get homogeneous ultrathin sections, it is common to get sections with slightly different thickness. How thick is an ultrathin sections can be estimated by the color that the section reflexes from its surface. This color can be gray (less than 60 nm), silver (60 to 90 nm), pale gold (90 to 120 nm), dark gold (120 to 150 nm), and purple (150 to 190 nm). Figure 2. Ultrathin sectons are obtained with the so-called glass knifes, which are made from glass bars. Ultrathin sections remain on the water surface of the knife water container (Figure 3). They are collected on cooper or nickel grids. The grids are rounded and thin, and they have a mesh that can be more or less dense, for small or large sections. The windows, space without bars, range from a hundred to several hundreds of µm2. These grids offer the best image quality because electrons cross just the section before hitting the visualization screen. However, the section regions overlapping the bars cannot be observed. There are other "grids" that have only one large window where the whole section can fit. Of course, a supporting film, made up of resin known as formvar, must cover the window. This film is very thin, lets the electrons going through and keeps the section.